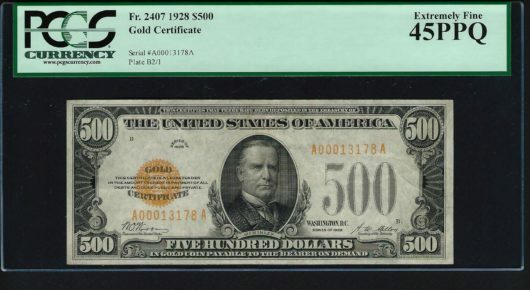 Fresh back from PCGS – 1928 $500 Gold Certificate. 420,000 were printed, but the vast majority were never released or redeemed and destroyed. Today less than 100 survivors exist. This very original EF 45 ranks among the top 10% in quality as only a hand full of true UNCs notes are known to exist. This note has the attractive, creamy white paper commonly seen on the issue. There is however nothing typical about the centering here which is stunning. Fr. 2407s are notorious for razor thin bottom margin almost regardless of plate position. 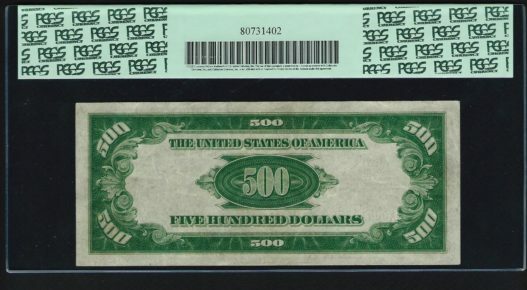 This B plate note has more than abundant bottom margin resulting in an almost perfectly centered note ! As a reference point, the last EF 45 EPQ or PPQ that sold at auction was in August 2015. That note brought $23,500. So if you’re in the market for a really CHOICE $500 Gold Certificate, this may very well be your note. Infact, the overall paper quality is very close to AU.